The origin of the problem in reality lies with global production issues of Molybdenum-99, the mother radionuclide of Technetium-99m, and the consequent impact on Nuclear Medicine both in the UK and around the globe. The origins of Nuclear Medicine began when the radioactive tracer principle was first established in 1913 by George de Hevesy, a Hungarian radiochemist and later Nobel laureate working at Ernest Rutherford's laboratory at the University of Manchester from 1911 to 1914. Nuclear Medicine proper, however, could be said to have been founded by John H. Lawrence (brother of Ernest O. Lawrence, inventor of the cyclotron) and Joseph G. Hamilton, two American physicists at Berkeley, University of California, who were also both qualified in medicine. Circa 1936/37, John Lawrence treated a patient with leukaemia by administering a radioactive isotope of phosphorus, which was the first time that a radionuclide had been used in the treatment of a human disease. Lawrence became known as the father of nuclear medicine, and his Donner Laboratory is considered to be the birthplace of this field. Joseph Hamilton, however, realized that to avoid medical side-effects such as radiation doses, radionuclides with a short half-life were needed, and asked Glenn Seaborg, a later Nobel Chemistry laureate at the Berkeley Campus of the University of California, for help, specifically looking for an isotope of Iodine with a half-life of about 1 week. In 1938, Seaborg and Jack Livingood bombarded tellurium with deuterons in their laboratory's 94 cm cyclotron, creating iodine-131, with a half-life of 8 days. Iodine-131 was the beginning of the laboratory's ongoing role in the discovery and use of radionuclides, and the early development of nuclear medicine imaging and tracing was centred around this radionuclide, initially as a straight isotopic substitution for the stable Iodine-127 in thyroid studies and later as a label with several different pharmaceutical substrates that then distribute to and accumulate in particular organs of interest. Although its half-life allowed a convenient journey from radiopharmaceutical company to hospital to patient, its beta emission and its high gamma energy of 364 keV limited the activity doses that could be administered to a patient and created the necessity for heavy lead shielding around probes and later gamma cameras. All this changed with the discovery and nuclear medicine adoption of another radionuclide, Technetium-99m, which remains the radionuclide most commonly used in nuclear medicine today. Technetium-99m was actually discovered in 1938 by Emilio Segrè. After a visit to Ernest O. Lawrence's Berkeley Radiation Laboratory, Segrè was sent a molybdenum strip from the laboratory's cyclotron deflector in 1937 that was emitting anomalous forms of radioactivity. After careful chemical and theoretical analysis, Segrè was able to prove that some of the radiation was being produced by a previously unknown element, dubbed Technetium, and was the first artificially synthesized chemical element that does not occur in nature, because all of its isotopes have a half-life much shorter than the age of the Earth. 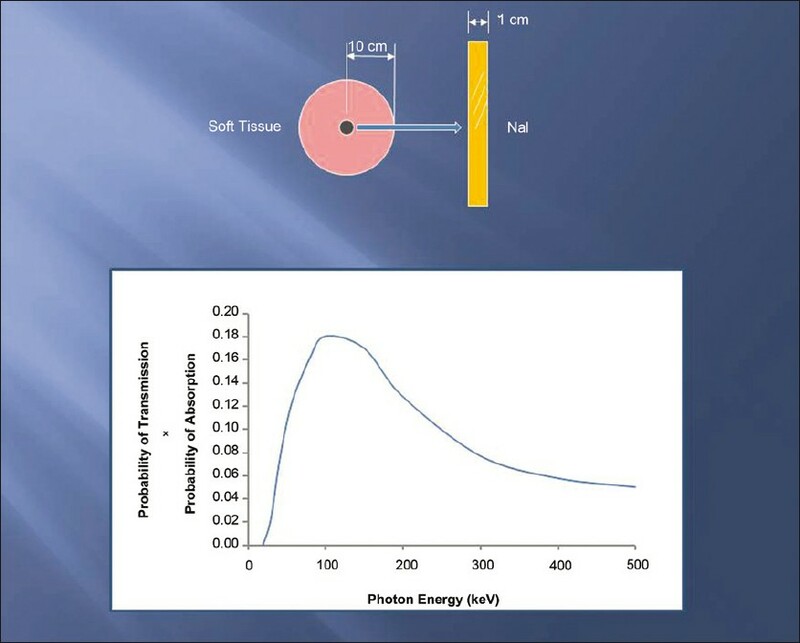 Technetium-99m decays by isomeric transition, with a pure gamma ray emission of 140 keV, which was to prove crucial in improving Nuclear Medicine images and reducing patient radiation doses. Assume for a minute that a patient may be represented as a cylinder of human tissue of radius 10 cm with a series of radionuclides with differing gamma emissions sequentially placed on the cylinder axis and a gamma ray detection system such as a gamma camera nearby consisting of a crystal of sodium iodide with a thickness of 1 cm and associated photomultipliers, etc. Then, if the product of the probability of gamma transmission through the tissue times the probability of gamma absorption by the sodium iodide crystal is plotted for different radionuclide gamma energies as in [Figure 1], it can be seen that 140 keV is near the peak of the curve at a combined probability of 0.167, approximately 2.7-times greater than that for the Iodine-131 energy of 364 keV. Further, the radiation dose rate of Technetium-99m is only about 35% of that of Iodine-131; hence, larger patient activity doses could be used, leading to better image quality or shorter acquisition times. Technetium-99m has a half-life of only 6 h, and hence any activity dose administered to a patient will have dropped after 24 h by a decay factor of 16. But, conversely, this means that so will any purchased radioactivity delivered from a radiopharmaceutical firm 24 h later, which was no doubt one of the reasons for the slow adoption of Technetium-99m rather than Iodine-131 as the main medical imaging radionuclide of choice. It is the daughter radionuclide of Molybdenum-99, half-life 66 h, and it made more practical sense to develop a Technetium generator system whereby Molybdenum-99 is instead delivered to a hospital radiopharmacy on a weekly basis and an elution system used to produce Technetium-99m on a daily basis, to be onwards used for the manufacture of labelled radiopharmaceuticals. 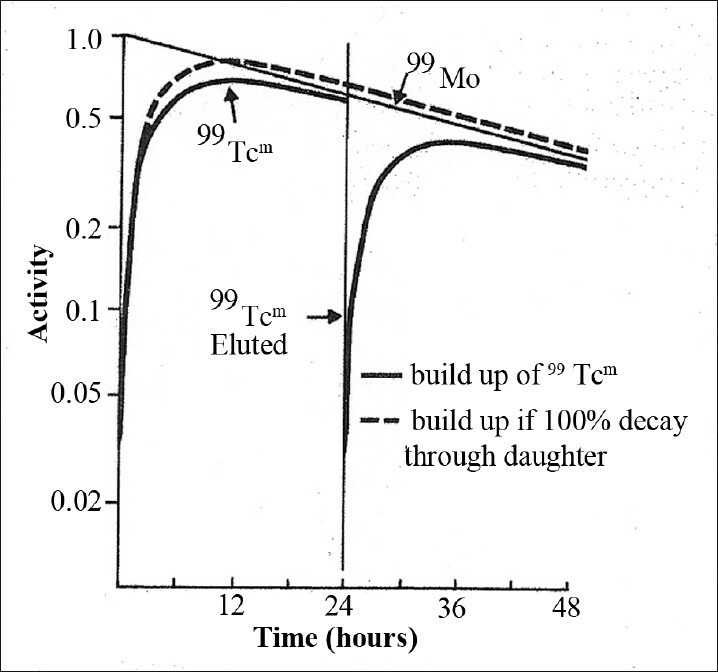 It can be seen from [Figure 2] that the activity of Tc-99m peaks just before 24 h. Therefore, if elution takes place at the same time every day, virtually the maximum activity of Tc-99m can be extracted for that day's manufacture of radiopharmaceuticals. 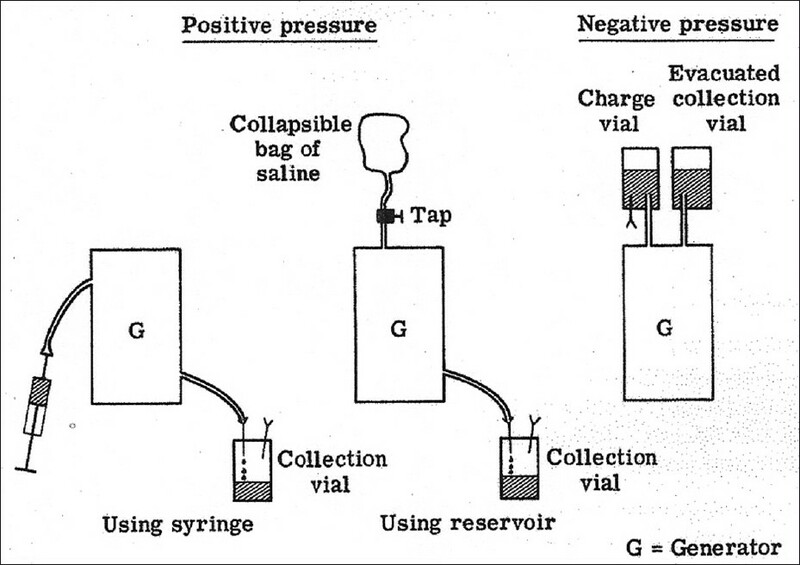 There are two methods of separating the daughter radionuclide from the parent, being chromatographic columns [Figure 3] and solvent extraction [Figure 4], the former being the most popular in the West and the latter being chiefly used in India. 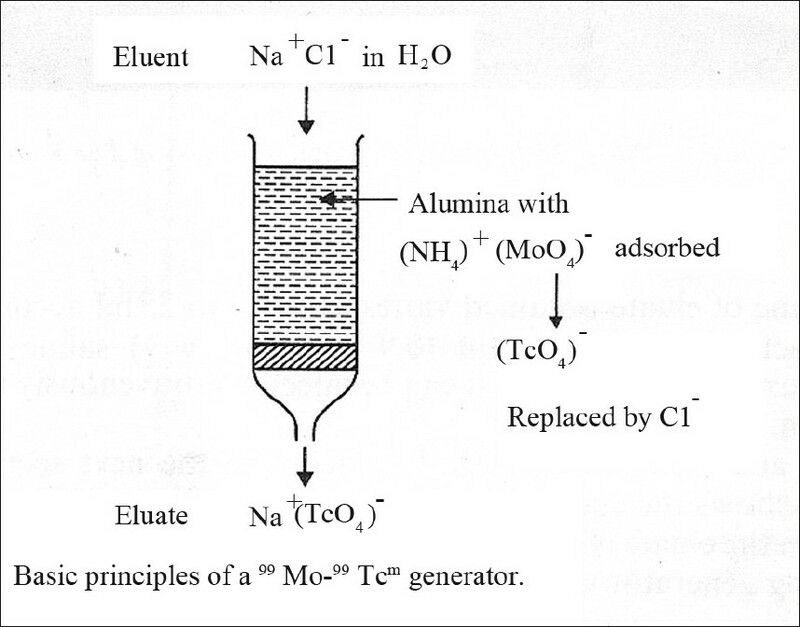 Realisation of the chromatographic separation method column is a different matter, however, and Walter Tucker and Powell Richards designed the modern Technetium Generator based on ammonium molybdate adsorbed onto an alumina column as in [Figure 3], three variations of which are seen in [Figure 5]. 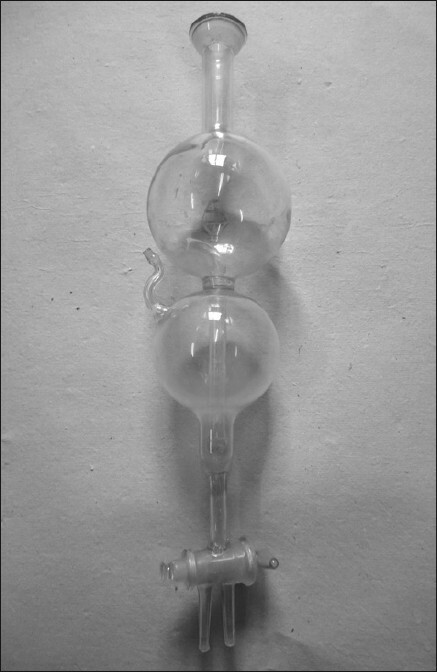 The first variation produced by The Radiochemical Centre in the United Kingdom (later Amersham International) was based on the positive-pressure syringe method [Figure 6], and was later replaced by the award-winning MCC4, which was a positive-pressure system based on two vials, itself replaced by one or two designs before the highly successful Amertec II [Figure 7], which was a negative pressure system based on an internal collapsible bag of saline. 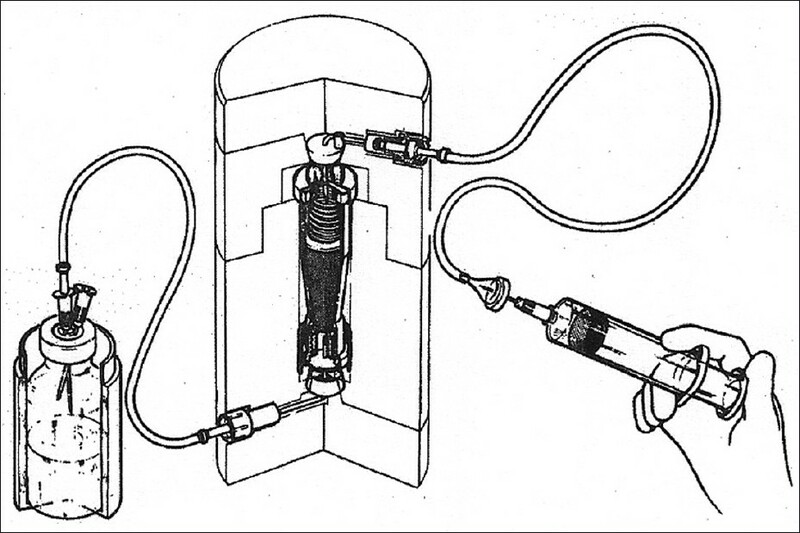 A small number of clients found the volume of the saline bag insufficient, and with the takeover of Amersham International by GE Healthcare, the Amertec II was replaced by the negative-pressure Drytec Generator [Figure 8], which used an evacuated receiver vial to draw the Tc-99m eluate through the system. GE Healthcare and other Technetium generator manufacturers such as Covidien, IBACisBio and Lantheus all depend on the supply of bulk liquid Molybdenum-99, which is usually reactor produced as a fission fragment by the 235 U (n, f) 99 Mo process. In the UK in the 1960s and early 1970s, there was a high-flux nuclear reactor at Harwell, Oxfordshire, which used to produce Mo-99 for The Radiochemical Centre via the 98 Mo (n, γ) 99 Mo reaction, but the UK government decided not to invest money in developing this facility, and it closed down probably in the 1980s. The current world supply chain is essentially as outlined in [Figure 9], where 235 U targets are irradiated in nuclear research reactors before being sent to companies with 99 Mo-processing facilities. It is these companies that produce the 99 Mo bulk liquid that goes to the 99m Tc generator companies such as GE Healthcare in the UK. In India, stages 1 and 2 are both carried out at BARC in Trombay [Figure 10], and small aliquots of 99 Mo liquid are sent directly to hospital radiopharmacies, where Methyl Ethyl Ketone is used to extract 99 Mo for onward use in the manufacture of labelled radiopharmaceuticals. Around the world, generally, there is no problem with companies providing stages 2 and 3 of the supply chain. Since 2007, however, the problem, a huge problem, lies with the stage 1 nuclear reactors that irradiate the 235 U targets for the 99 Mo-processing facility companies. The reactors are all high-flux research reactors, and in 2007, just five reactors (excluding BARC) supplied the whole world, none of which had medical radionuclide production as its primary purpose and all of which are nearing the end of their useful lifetimes, with most of them aging rapidly, [Table 1]. In the UK, there are three Stage 4 suppliers of 99 Mo/ 99m Tc generators whose primary sources of 99 Mo and shares of the market are as in [Table 2]. It will be noted that the UK's GE Healthcare gets its Molybdenum-99 from the SAFARI reactor in South Africa. Thus, the Mo-99 already has a long journey across half the world, during which time it will lose approximately half of its activity owing to decay. 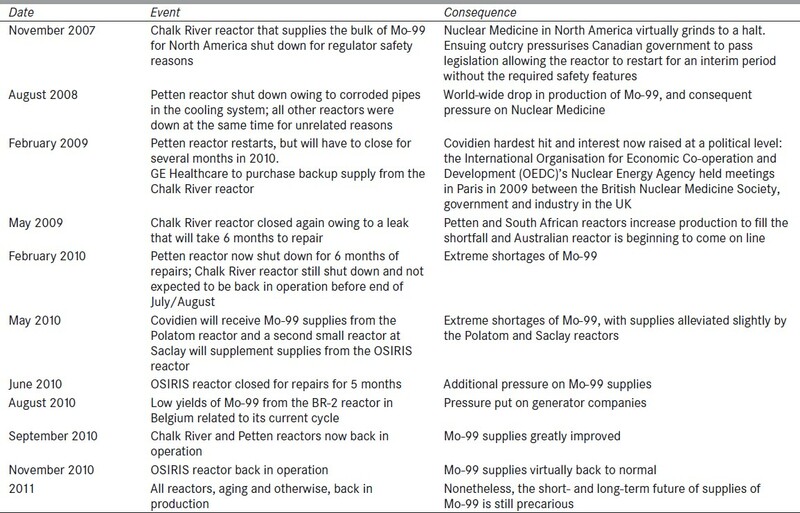 The problems with the world supply of Mo-99 started in November 2007 with the Chalk River reactor, and further problems followed in 2008 (see the time line in [Table 3]) with the Petten reactor, followed once again in 2009 by the Chalk River reactor, and these have had world-wide repercussions. Since then, the Maria reactor in Poland (commissioned in 1974) and the LVR-15 reactor in the Czech Republic (commissioned in 1957) have offered their services, as has the OPAL reactor in Australia (commissioned 2006), although these are unlikely to solve the world-wide shortage of Mo-99 problem. Studies in which other imaging modalities are specifically contraindicated, e.g. patients in renal failure where intravenous contrast may not be given for computed tomography or magnetic resonance imaging. Clinically urgency as determined by discussion between managing clinicians. 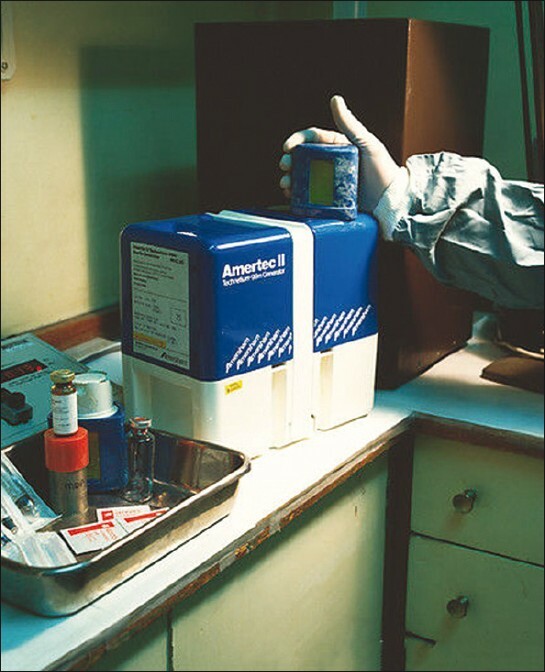 Other possibilities discussed included moving high-activity scans such as bone scans toward the beginning of the Tc-99m generator's life and low-activity scans such as lung scans toward the end, and also using other radionuclides such as myocardial perfusion imaging with Thallium-201, effectively managing limited Tc-99m resources. Although the five world research reactors of [Table 1] plus the Maria reactor in Poland, the LVR-15 reactor in the Czech Republic and the OPAL reactor in Australia plus a Russian reactor (Rosatom) and some American university reactors are now all on stream producing molybdenum-99, the long-term future is not assured, although some European countries (but not the UK) are putting investment into building new nuclear reactors to replace the five aging reactors of [Table 1]. The government of the UK is doing nothing in the way of investing in an indigenous supply of Mo-99, and is leaving it to other, notably European, countries to invest in the nuclear plant to provide the Molybdenum-99 needs of the UK. One UK company, Tokamak Solutions, has a grant from the Technology Strategy Board to investigate producing medical radionuclides from a fusion reactor, but this is a long way off a working fusion reactor, and possibly 2015 before the production of commercial medical radionuclides or even longer. 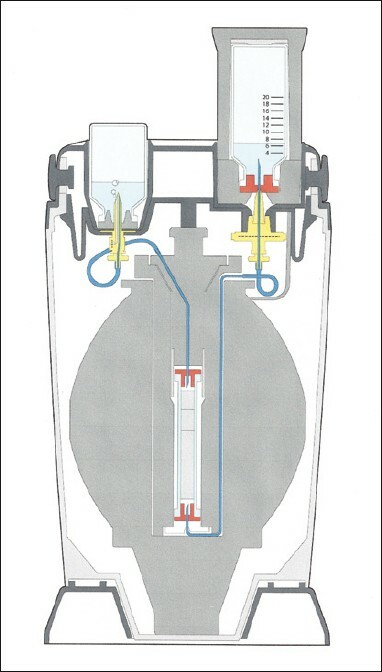 It is likely that many European reactors will be reconfigured to use low-enrichment fuel rather than the high-enrichment fuel at present, with all the security problems of a high concentration of Uranium-235. The future of Molybdenum-99 supplies for nuclear medicine in the UK, if not bleak, does not look very assured at the moment. 1. Ballinger J. Update on the Molybdenum Crisis. Appendix 1 of the UK Radiopharmacy Group 2009 Q2 Newsletter. 2. 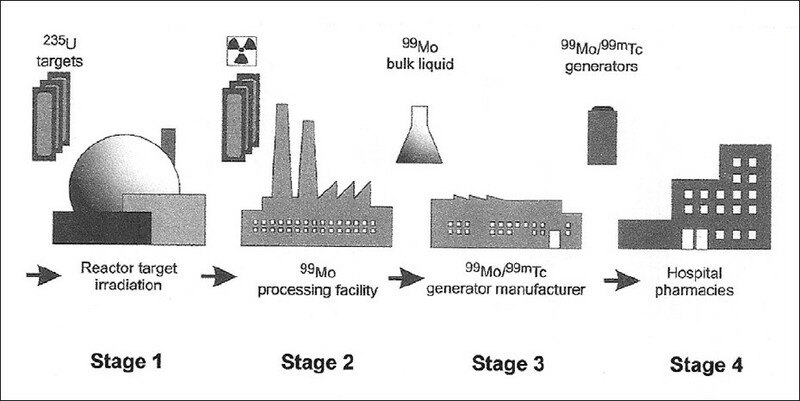 Ballinger J. Short- and long-term responses to molybdenum-99 shortages in nuclear medicine. Br J Radiol 2010;83:899-901. 3. The Administration of Radioactive Substances Advisory Committee, ARSAC: "A Review of the Supply of Molybdenum-99, the Impact of Recent Shortages and the Implications for Nuclear Medicine Services in the UK", a Report produced for the Health Protection Agency (2010).